TV encoder targets for handheld device, surveillance camera and automobile market. Supports multiple output formats such as analog TV (NTSC and PAL), VGA and HDTV ( 480p,576p,720p, 1080i). Sync signals can be provided in separated or composite manner. Three on-chip 10-bit high speed DACs providing flexible output capabilities such as single, double or triple CVBS output, YPbPr output, RGB output and simultaneous CVBS and S-video output. 90/180/270 degree image rotation and vertical or horizontal flip. 16-Mbit SDRAM is used as a frame buffer for frame rate conversion. Flexible up and down scaling. Programmable 24-bit/18-bit/16-bit/15-bit/12-bit/8-bit digital input interface supports various RGB (RGB888, RGB666, RGB565 and etc), YCbCr (4:4:4 YcbCr, ITU656) and 2x or 3x multiplexed input. CPU interface is also supported. Supports flexible input resolution up to 800x800 and 1024x680. Pixel by pixel brightness, contrast, hue and saturation adjustment for each output is supported. (For RGB output, only brightness and contrast adjustment is supported). Pixel by pixel horizontal position adjustment and line by line vertical position adjustment. TV/Monitor connection detection capability. DAC can be switched off based on detection result. Supports slave input clock mode only. Fully programmable through serial port. IO and SPC/SPD voltage supported is from 1.2V to 3.3V. The CH7026 is a semiconductor device targeting for handheld market, surveillance camera and automobile multimedia system. This device accepts digital video signals through its 24-bit input bus and generates NTSC, PAL, VGA or HDTV (480p, 576p, 720p and 1080i) video signal by its 10-bit DACs. 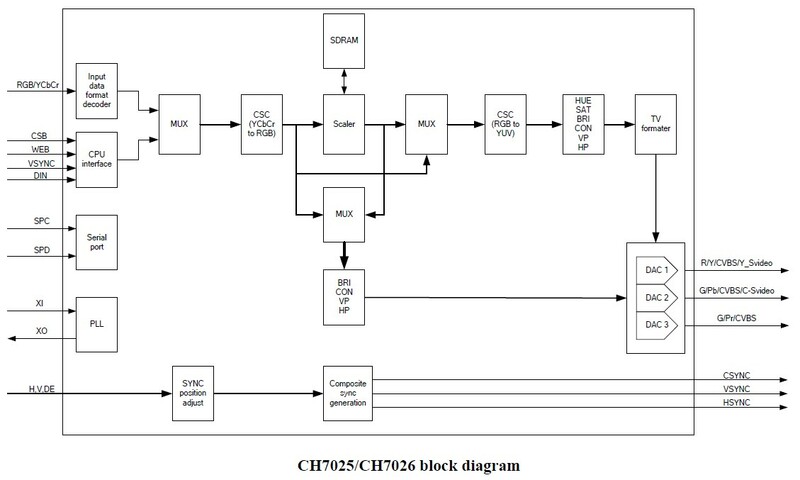 In addition, CH7026 has an embedded 16-Mbit SDRAM to support the CPU interface. CH7026 has incorporated an advanced technology that can perform real-time video rotations and frame rate conversions for incoming video stream. These complicated tasks are achieved by storing video data to the internal SDRAM and applying scaling process if required. CH7026 provides great flexibility for accepting different video data formats including RGB and YcbCr (e.g. RGB565, RGB 666, RGB 888, ITU 656). The CH7026 is available in BGA or QFP package. PCB Layout and Design Considerations for CH7025/CH7026, AN-B005.